For more than half a century, it has hung in the hallway of the Four Seasons Restaurant on Park Avenue, an immense work by one of the greatest artists of the 20th century. But Picasso’s curtain is coming down — and that might just destroy it….. The interior of the Four Seasons was given landmark designation in 1989, canonizing the achievements of Mies van der Rohe, the architect who designed the 38-story skyscraper, and Philip Johnson, who designed the restaurant, the costliest ever constructed when it opened in 1959. 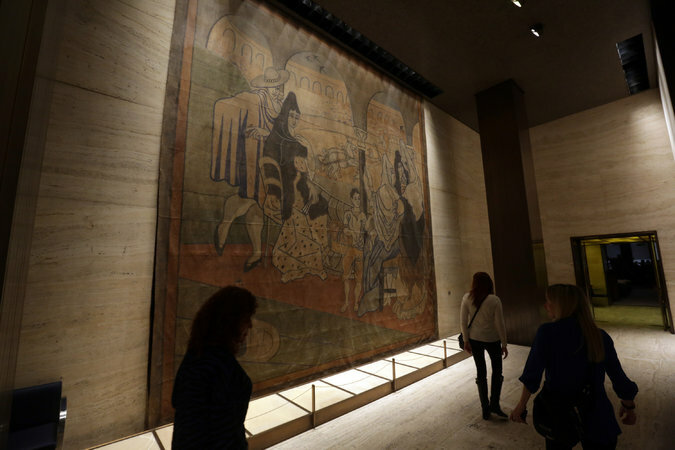 The Picasso, however, was excluded from the designation because, as the New York City Landmarks Preservation Commission explained in a statement, it was owned separately and could be moved.